This mixed-method study explored a cohort of 18 preservice elementary teachers' perceptions of technology and their abilities to integrate technology in their teaching. Data sources included blog postings, a confidence survey, lessons plans and observations. Results showed a disconnect between the blog postings and confidence survey (their perceptions) and their lessons plans and observations (their abilities). Five case studies were examined, using the TPACK framework, to determine where the disconnect was occurring. Although Technical Knowledge seemed to be an issue for some, the majority of the preservice teachers struggled with Pedagogical Knowledge. Suggestions for how to address this issue are included. Implications for teacher education are discussed. The review of literature for this study focuses on two main concepts: Technological Pedagogical Content Knowledge (TPACK) Framework and technology transference. 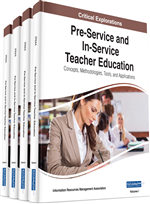 These terms are discussed in terms of preservice teacher education.